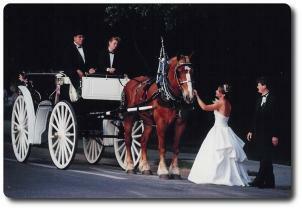 Greengate Farm Carriage Service, LLC, provides professional carriage services in the North-Central Florida area. Let our, classic, elegant carriages, finely harnessed horses, and formally attired drivers make your special event a memory of a lifetime. 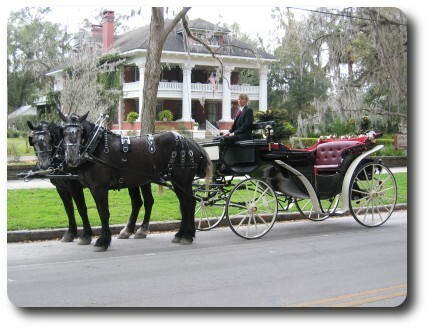 From formal elegance to the rustic charm of a wagon ride, from city streets to country backroads, our drivers, horses, and vehicles, will meet your needs. Our services are competitively priced and affordable. Please contact us for your reservation. We are proud members of the North Florida Event Professionals, a group of dedicated wedding and special event providers who offer exceptionally high quality services for all your wedding and special occasion needs. We also regularly work with many fine providers, please see our links page. For Sale pages. We may be able to help you find what you're looking for. We are members of the Florida Draft Horse, Pony & Mule Association and proudly host their website here..